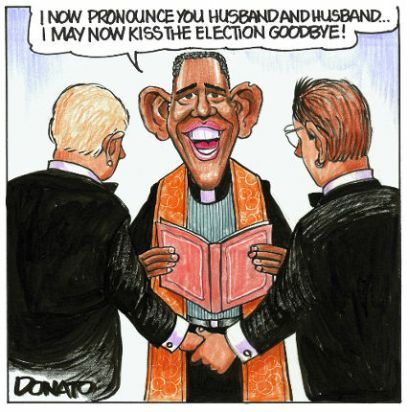 Louie Giglio is the pastor that was originally tabbed to give the benediction at Obama's inauguration but has recently withdrawn amid the surfacing of a controversial 1990s sermon in which he called homosexuality a sin (read: practically blew Leviticus). There has been some back and forth in conservative circles over whether Giglio himself withdrew, or whether the White House forced him out with some sort of "withdraw and save face or we're kicking you out," ultimatum. Which is the sort of preposterous horseshit you can expect from conservatives these days. I commented "I bet LGBT people of faith are pretty psyched about it," which Burk may or may not allow to be seen. Potshots aside, the truth of the matter is that the President and his staff can choose whoever the hell they want to deliver the benediction at the inauguration. And let's be clear, Burk's word choice is incredibly (probably deliberately) poor. No one forced the removal of Giglio. They didn't take away his robe or burn down his church, they (maybe!) said hey, "don't give this benediction." That is worlds different than what a lot of Burk's readers are going to assume. I am forced to ask: how is it an affront to religious liberty to not use the services of a guy you don't like?